I entered into full communion with the Catholic Church about four years ago with my wife, Heather and two girls. Suffice it to say – we love being Catholic and believe (not only) that we were called but the Catholic Church represents that “unified body” Christ and the Apostles talked about throughout the New Testament. I recognize, although I was called, that I did not come into the Church without help. People, integral to my conversion, were personalities like Father Roderick of SQPN, Father Seraphim Beshoner, TOR of Catholic Under the Hood, the Missionaries of Charity, Father Glenn Sudano, CFR, Father Hugh Vincent Dyer, O.P. and the many Catholic bloggers / podcasters that I frequently listened to and debated in my study of the Church and her teachings. After my conversion I took a job with a local (Dallas Diocese) Catholic parish and have been blogging at my new address: 21centurypilgrim for the past year. In light of the role Fr. 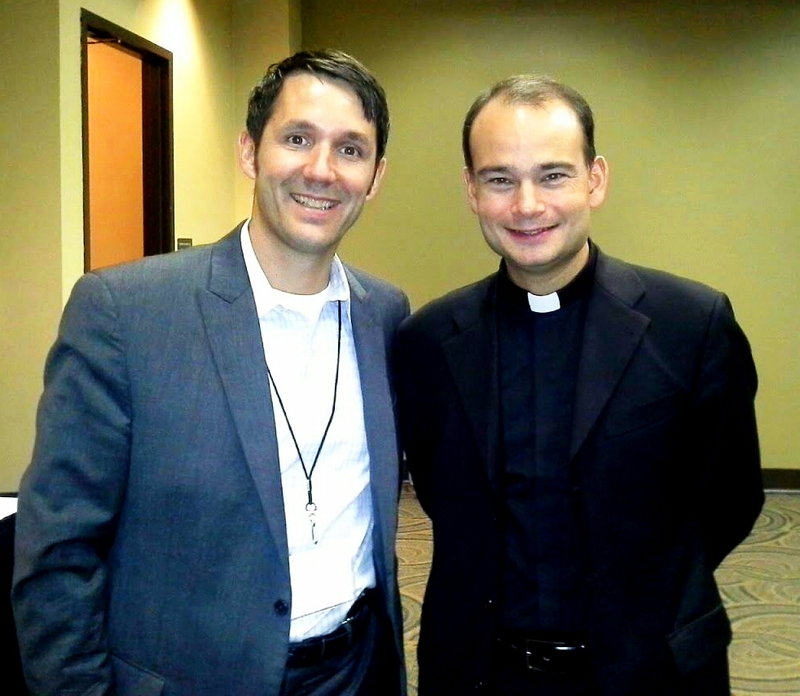 Roderick played, my new job and personal passion to share my thoughts from the journey I was excited at the opportunity to attend the Catholic New Media Conference in Arlington Texas. I believe wholeheartedly that the internet, individuals seeking relationships via digitally based communities, represents a huge opportunity to connect, discuss issues, and share our collective faith journey. Faith in general and the Catholic Church in particular are ideas that many are just waiting to discuss. I remember my pre-Christian / pre-Catholic years – I desperately wanted someone to reach out to me. I often went to bed at night feeling alone, rejected, and unheard. These are just some of the reasons why I believe so strongly in the emerging digital mission field and the need for (Catholic) digital missionaries. I really appreciated the variety of both Catholic and non-Catholic, lay and religious presenters at this conference. In addition, I enjoyed the variety of subjects covered and the diversity of personalities who have risen to the top of their respective fields in relation to blogging, podcasting, short-film / video casting, and even Q & A over the ethics of it all. The keynote speakers all had something “significant” to share. In particular Jennifer Fulwiler (@conversiondiary) did a great job speaking to the opportunities (of digital engagement) and pitfalls (demonic distractions) of our collective work in the digital marketplace. I also enjoyed the analysis of Brandon Vogt’s (@BrandonVogt1) presentation and honesty of Elizabeth Scaila’s (@TheAnchoress) thoughts. Her encouragement to “write what your passionate about” cut against the grain of writing to get noticed, increase immediate traffic, or the pumping of pure ego. Each speaker / presenter genuinely spoke to the importance of developing a connected community. It’s not just about numbers and the money that can come with it – but about sharing our experience with God, exploring truth and expressing our faith. In addition, as it related to direct evangelization, there was much conversation about “earning your right to speak into the lives” of those we connect with over the internet. This was a welcome bit of wisdom filled with the sensitivity of a pastor. Wisdom I appreciated after a decade of being a protestant pastor and missionary – evangelizing on college campuses, in neighborhoods, American cities and in different countries about the world. I write these reflections today because of the importance of the subject, the expression of our faith within the digital sphere of society, and because of the hesitancy I often see within local Catholic communities. Many have embraced this new digital age – Pope Benedict XVI has embraced and called for digital evangelization. However, many of our local communities are still hesitant – worried about the development of digital relationships, pitfalls from past mistakes, and an overly litigious society that seems to target the Church at every turn. Although we are an old Church (+ 2000 year history) with aging congregations unfamiliar with the digital sphere there is an emerging youth, young adult and convert community excited about this particular opportunity. The opportunity to be an integral part of the New Evangelization, the growth of the Church in the 21st century and the fulfillment that simply being Catholic brings into the life of the individual. Its about renewal, its about truth, its about sharing Christ within a world looking for answers. Join me on this pilgrims “digital” path. Love it, Eric. Particularly the reference to writing what you are passionate about. So true and so necessary. In my experience – nearly forty years a Christian – my historic home within the evangelical congregations has moved considerably away from establishing mission on the basis of passion, a passion from and for God, to a mission based upon financial viability and achievable, measurable outcomes. StPaul might invite us to reflect on how far we have been conformed to this present age in our pursuit of evangelisation. I note that after three years of solid investment, passionate preaching, amazing miracles and faithful prayer, Jesus only had 12 disciples, one of whom was to betray him. I do not know a present day foundation of philanthropist who would invest in his ministry when he can only show 11 committed disciples after three years full time endeavour. However, Jesus’ passion was captured by those 11 and the world was turned upside down. All power to you Eric as you seek to continue to turn the world upside down in the years ahead. I too was encouraged by the idea of “living / writing” in our passions. My heart is for the world and sharing stories from the journey. At the end of the day it boils down to LOVE – God’s love for you, Jayne, your community and the world around (us) you. And we are but a reflection of that love in the earth. I am so excited and encouraged and will continue to work / live in my passions. Glad to know you honed in on the passion, as well. One of my favorite parts of the CNMC is realizing, when we’re all in the room together, that we are all coming to Christ in our own unique journey. It’s awesome to be able to share it with one another! Thanks for your thoughts!